The kitchen is the heart of the home. This is where traditions are born, cravings are satisfied, and where a majority of company will discuss their daily lives. Sometimes, it is good to add some flavor to your kitchen. Design tastes are constantly changing and there may be some in particular that you have been thinking about using in your own kitchen. Perhaps, you may be thinking about dark kitchen remodel ideas! Adding some dark accents to your kitchen can be a great look in modern kitchens, so let’s go ahead and dive in! Anytime you do a big change or remodel in the kitchen, you will want to take a look at the color of your cabinets. Consider staining your cabinets or upgrading them to match your new appliances, countertops, or floors. Dark mission style kitchen cabinets, for example, are popular for contemporary looks and are a timeless cabinet style. Keep in mind that dark kitchen cabinets will look best with lighter countertops, lighter floors, or lighter paint on the walls to contrast with the dark cabinets. Once you have a good idea of what your cabinets will look like, you can move to other elements that bring the kitchen together. After you handle the cabinets, you can move right along to the appliances. In most cases, you will want all these to be matching in color. Pairing cabinets or countertops with dark appliances is a great look, and black stainless steel appliances are popular in modern kitchen trends. They look great with both light and dark cabinets and countertops. Opt for light colored countertops or cabinets to make the contrasting dark appliances pop, or dark cabinets and counters to make the appliances blend in. Darker flooring can add to the cool and modern style you aim to create. It is also a massive element that can change the way the whole kitchen feels. Take your time with this one and choose a flooring that pairs well with the cabinets. If you prefer, you can choose a light flooring that can still match the dark theme you are going for. Light floors can even accentuate the dark theme if done correctly. If you do not want to do a complete remodel for your kitchen floor, you can stain the wood floors a darker color. The backsplash of the kitchen is a fun way to accent the entire remodel. This is also an opportunity for you to get creative without making a drastic change to your kitchen. 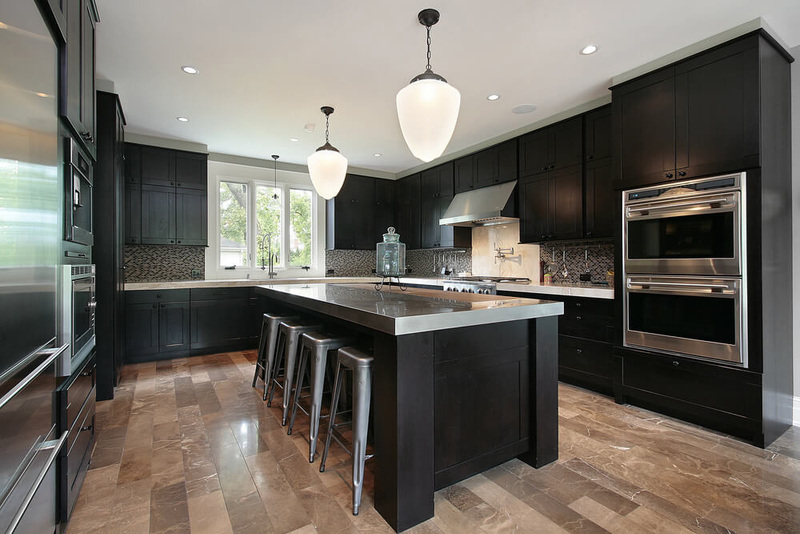 Solid colors can be a great option to accentuate a dark kitchen theme. You can also look into tile patterns; with plenty of patterns to choose from, you’ll be able to match the rest of your kitchen perfectly. If you have dark countertops, appliances, or cabinets, it might look best to choose a contrasting, lighter color or pattern for your backsplash. What’s the point of remodeling a dark kitchen if you can’t see it well enough to appreciate it? Even though the colors are dark, you want to ensure that the area is lit adequately so you can enjoy the space. Add enough lighting to properly light up your entire kitchen, but add light dimmers so you can have more control over it. Installing smart light bulbs in your kitchen and dining room can give you more control over your kitchen design; simply change the kelvin temperature to be cool or warm, and change the entire color altogether to set the mood for dinner parties.